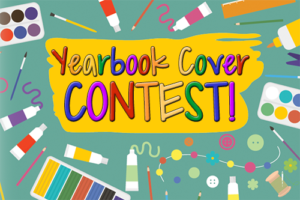 It’s time for the 2018-2019 Yearbook Cover Contest! This year’s theme is ! Design a cover that represents what this means to you, and YOUR ARTWORK could be chosen for the yearbook! School Theme: The Sky’s the Limit! Must be created on white letter sized paper (8.S” x 11″). The paper needs to be vertical (portrait) NOT horizontal. Crayons, markers, paints, water colors or colored pencils may be used. Color in all of the white space on the paper. Artwork must be the student’s original artwork, not computer generated, traced or copied. Do not fold the drawing. Write your full name, grade and teacher in pencil ON THE BACK – DO NOT put your name, teacher or grade on the front. There will be ONE winner for the COVER, and a winner from each grade level will be displayed on the back. Submission deadline for your artwork is Tuesday, November 20. The Yearbook Committee cannot accept artwork after this date. Students may submit only ONE piece of artwork for consideration. Students should turn in their submission to their teacher. Any questions? Contact Toni Tucker at publicrelations@harbordalehsa.com.